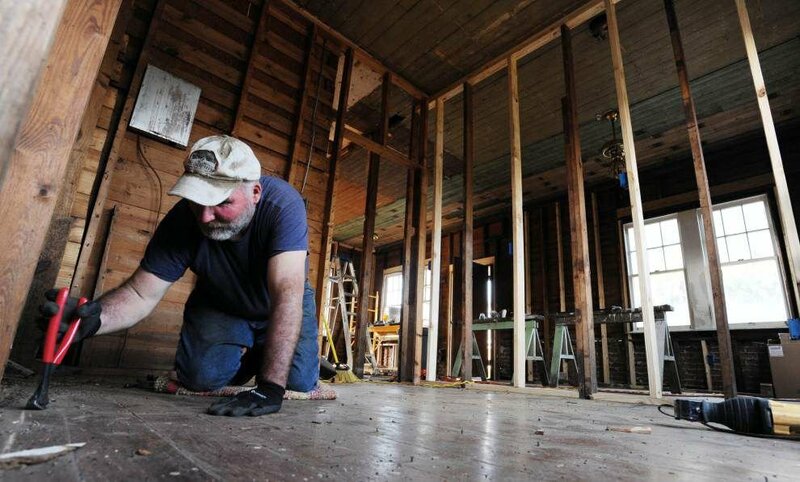 Advocate staff photo by LESLIE WESTBROOK -- Jim Bujdosa pulls up floorboard nails from a house under renovation on Clinton Street Friday, February 12, 2016, in the Freetown neighborhood of Lafayette, La. The house, which showed signs of several "layers" of renovation was probably built before the 1920's, he guessed, because of the types of nails he was finding in the construction. Advocate staff photo by LESLIE WESTBROOK -- Houses along Jackson Street are pictured Friday, February 12, 2016, in the Freetown neighborhood of Lafayette, La. Advocate staff photo by LESLIE WESTBROOK -- Artist Francis Pavy affixes linoleum to wood bases to carve into printing blocks Friday, February 12, 2016, outside his studio, a decades-old building which he has used to create works of art for 35 years, in the Freetown neighborhood of Lafayette, La. Advocate staff photo by LESLIE WESTBROOK -- A Freetown sign is pictured at the corner of General Mouton Avenue and Pinhook Road Friday, February 12, 2016, in the Freetown neighborhood of Lafayette, La. 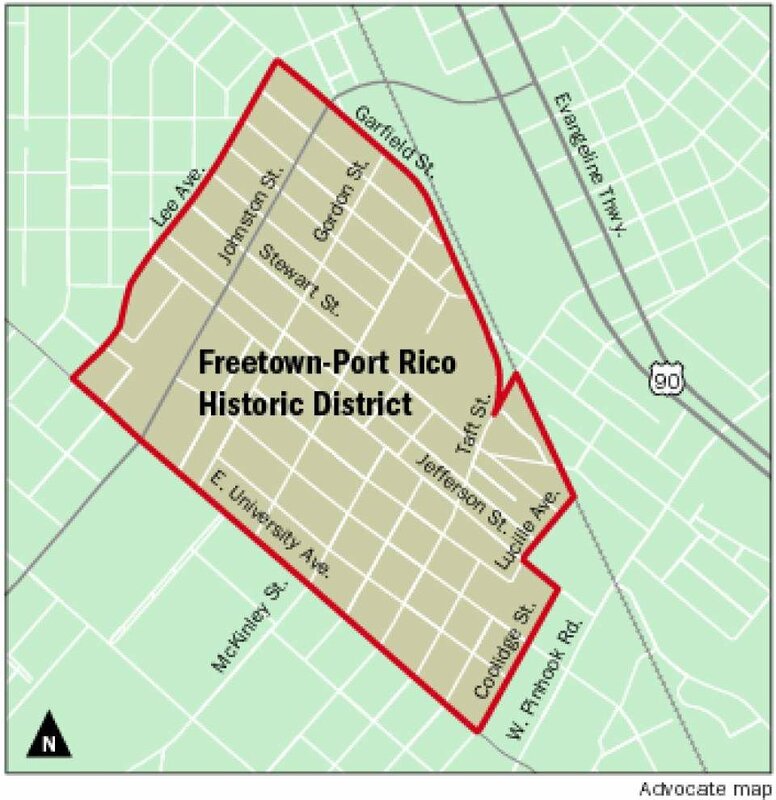 Freetown-Port Rico, a Lafayette neighborhood that once was a safe haven for freed slaves, has been added to the National Register of Historic Places. The long-sought designation, which came this week, is expected to boost the ongoing redevelopment of the neighborhood, mainly through tax credits. Members of the Sustainable Development Lab at the University of Louisiana at Lafayette worked for more than two years on the neighborhood’s nomination to the register, documenting the community’s more than 800 structures. The designation also gives the neighborhood much stronger negotiating power in the upcoming Interstate 49 Connector planning process, which is planned to run along the edge of Freetown, Brooks said. Francis Pavy is a painter who has maintained his art studio in Freetown for 35 years. His studio on the corner of Gordon and Clinton streets was a residential building in the ’20s, a furniture and gifts store in the ’50s, a food co-op “during the hippies,” a trophy shop and a used office furniture store before becoming his home. The biggest change he’s seen since moving into Freetown has been the gentrification of the neighborhood. This is the second neighborhood in Lafayette to make the National Register. Sterling Grove Historic District was added in 1984. There are, however, a number of structures in Lafayette already on the list. Once an area is named to the register, property owners with structures more than 50 years old can qualify for a 20 percent to 40 percent tax credit when making renovations or making preservation efforts, Saft said. The Freetown-Port Rico neighborhood is bounded by East University Avenue, Lee Avenue, Garfield Street, Taft Street, Lucille Avenue, Jefferson Street and Coolidge Street. Sugar cane was once grown on the neighborhood’s soils, which was once the back part of Alexander Mouton’s Île Copal Plantation. Mouton was a 19th-century Louisiana governor and U.S. senator. Shortly before the Civil War, Mouton owned the second-largest number of slaves in the parish, 120 slaves, second only to Antoine Mouton, his brother, who owned 122 slaves. Historical accounts differ, but the neighborhood is believed to have formed just before, during or shortly after the Civil War and was a place where newly freed slaves and the original free men of color could create a community. A 2.2-acre tract in Lafayette’s Freetown-Port Rico Historic District has been sold for $450,000.